From an ancient hunting site that provided a bottleneck into which Aboriginal people could drive the wood buffalo to a proud Metis community, Buffalo Narrows has been a center of human activity for centuries. 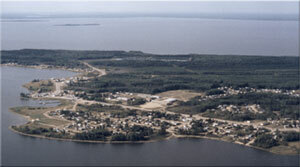 The community is nestled in the forests and lakes of what was the heart of voyageur and fur trade country in the northwest. Buffalo Narrows offers scenic beauty and serenity, yet is located on a paved highway courtesy twentieth century man. This affords a visitor the chance to take some time to explore the area, meet the local residents, and discover the rich and diverse natural beauty found in the area. From the majestic waters of two magnificent lakes that come together at the Narrows to the beautiful forests surrounding the large source waters of the Churchill River this is a beautiful land. The narrows was always a choice location among the people who lived here for countless generations before the incursion of European settlers, it offered them some of the best hunting and fishing in the north. From it's founding to the present day, the area's greatest wealth has been its lakes and forests, which continue to provide rich harvests. But there is more than that aspect of 'resource wealth' to the community, for Buffalo Narrows is indeed a community with a human heritage and we welcome those who would seek to know more of this. Sketches - Resident Profile ????? ?